There has been a planning application P18/V2127/LB since August to turn 23 High Street into a new bar / restaurant. The premises was used for many years by Smiths the Chemist. The rear area was also used as a reading room by Abingdon Library. Work is underway in renovating the basement and ground floor. The planning application says there has been flooding in the basement which will be tanked so that it can be used for storage and a restaurant area. The dispensary area will become the kitchen, and a modern flat roofed area to the rear will become an enclosed smoking area. 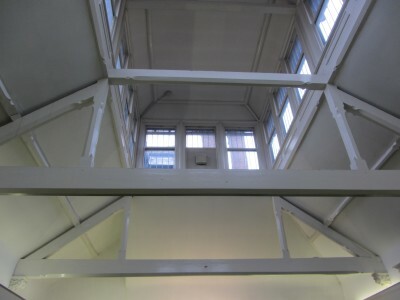 The lantern, above the former Abingdon Library reading room, at the back is an interesting feature. The plans say no major changes will be done to the front view from the High Street apart from installing stronger glass. 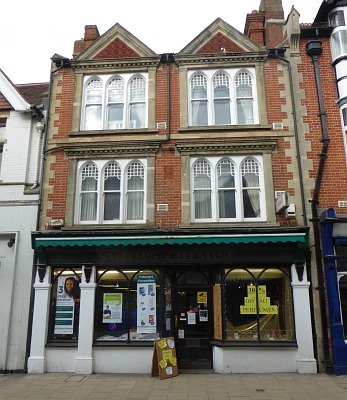 Smiths left the premises in April 2016 and were renamed as Avicenna Pharmacy, and took over the premises of a former pub in Stert Street, Abingdon. Abingdon Library left the back of the premises in the 1976, and moved to the Charter, Abingdon. Next door to The Narrows. Hopefully cater for a different market. …and opposite Stan James that is also becoming a restaurant? A few more restaurants won’t do any harm. What about a few more independent shops? Indeed Iain; two restaurants opening….what are the odds!